I was at a local Rubber Stamp Show on Saturday - and purchased these window overlay card kits from The Paper Cut. They also did a cool M&T with the acetate sheets . 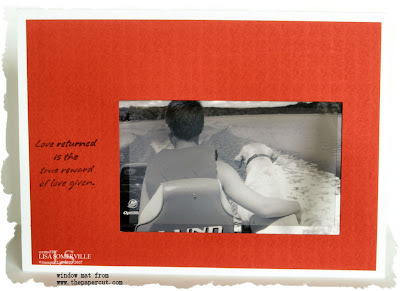 You can see how I used them in my project below (Jim & Lou). The acetate they carry is unlike any I've seen - it appears to be lightly sanded on one side, and has a strip of paper attached to the top, that makes feeding through your printer a breeze. When I set up my photos and printed them out, the ink on the acetate was completely dry. It also states, it's great for heat embossing - I'll put that to the test later this week. They've got some great time saving items on their website - be sure to check them out! 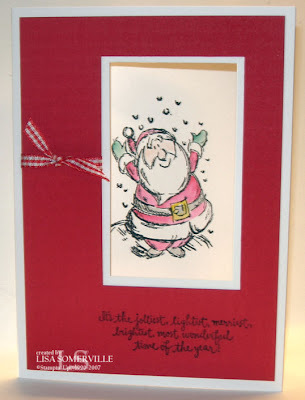 For this card, I stamped Jolliest Time of the Year in the inside - so it shows through the window to the outside of the card. Image was colored with inks and an aquapainter, sentiment was stamped in black. Red Gingham ribbon tied through the opening of the window. Again, I used the Window Overlay from The Paper Cut. Just a side note about the text - because this is stamped on textured card stock - the images do not transfer well when uploaded. Great cards! I'll check out the website to see what the window stuff is. Right now my brain is dull (acupuncture this morning..). thanks so much! I'll treasure this little book for sure! I love Paper Cut. I demoed for them one year when they came to Buffalo. They have some great stuff. Your cards are super. I see that santa again.